In this second part of our two part series on Mikhail Kalashnikov's life (see part one) and weapons, we will explore the design evolution of what is arguably the best military rifle design and certainly the most prolific rifle of the twentieth century, the AK-47. The production model of Mikhail Timofeyevich Kalashnikov's avtomat (assault rifle) had three distinct variants. The first model AK-47 had a receiver assembly made from a combination of a stamped sheet steel body and and machined steel inserts. The machined steel insert at the front of the receiver into which the barrel was screwed, and the stamped sheet metal rear assembly were attached to the stamped steel receiver body using a combination of rivets and welds. Welded to the receiver's bottom were both a pistol grip base and a trigger guard. The first model AK-47 also had the upper edges of the receiver folded inwards so as to form the guide rails for the reciprocating bolt carrier. 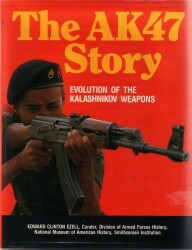 The beauty of the original AK-47 design was that it was engineered for manufacture on sheet metal punch- press machinery. The Russians, like the Germans, the British, and the Americans, had experienced severe shortages of raw materials, machine tools, and skilled laborers during the Second World War. As a result of these shortages, an intensive effort was made to design weapons and systems that could be made using the sheet metal stamping process. The technology itself was not new; it had been in use by the automotive industry for many years. The innovation came in applying this technology to the manufacture of weapons. The payoffs were potentially huge - by making the paradigm shift from components milled from solid steel bar stock to ones stamped out in large presses, the bulk of the effort was moved from the manufacture of finished components to the creation of the dies used to stamp out the parts. The German World War Two experience is particularly illustrative of this point. The production of the Flak 38 20mm anti- aircraft cannon is an excellent example. Production engineers at DWM found that by making the receiver from stampings, they could reduce their raw material requirements from 99 pounds to 18.7 pounds, man hour requirements were reduced seventy percent, and almost two hundred machine tools dedicated to the receiver's manufacture were freed up for other critical manufacturing requirements. The Soviet experience during the war highlighted this critical need to shift production capacity away from small arms to other critical areas. At the outset of the war, that portion of the Soviet arms industry engaged in the production of small arms and artillery was the best prepared for the demands placed upon it by the conflict. Other segments of the industry were not in nearly so good a position. The central economic planners had not given the same attention to those industries specialized for the manufacture of armored vehicles or aircraft. As a result, the production of rifles and machine guns was optimized in 1942, and deliveries of these items to the military proceeded steadily in 1943 and 1944. However, in the other areas of the Soviet defense industry, there was a severe shortage of machine tools and skilled workers. While machine tools ordered abroad in 1939 and 1941, and deliveries of American tooling under Lend-Lease aided significantly, most of this capacity did not come on line until very late in the war. The Soviet economic leadership was forced to search for a technological means to overcome the shortage of critical production equipment. Sheet metal stamping technology, when applied to small arms, made it possible to reduce the need for certain critical machine tools and allow the redistribution of existing production capacity. The Germans had come to the realization that the stamped metal assemblies were most efficient when they were applied to entirely new designs intended to take advantage of the technology. While components of older designs could be made out of stampings and pressings, this often led to problems where interchangeability with the original machined components was required. There was also an ingrained prejudice on the part of the users. While the stamped and welded components were often more durable than their machined counterparts, they were usually not as aesthetically pleasing. The prejudice was entirely unfounded - the stamped metal components were in no way lower in quality or less reliable, as can be attested to by the sterling performance records of the MP-40, the MG-42, and the StG44, all of which made extensive use of stamped and welded components. The most well known of Soviet wartime weapons that made use of sheet metal stampings were the 7.62x25mm Pistolet Pulemet Shpagina (PPSh41) and Pistolet Pulemet Sudayeva (PPS43) submachineguns. However, the design of the Degtyarev DP light machinegun also included significant usage of the stamped components. The DP, the PPSh41, and the PPS43 racked up impressive service records despite being made with extreme speed and with little attention to external finish. rolled steel, and eight from hot rolled steel; in contrast, the PPSh41 had fifty-eight machined parts, twenty-four cold stampings, and eight hot stampings. The PPS43 cut the machining time by more than half - 2.7 hours per gun as opposed to the PPSh41's 7.3. 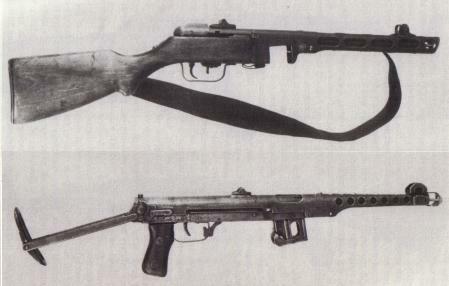 The PPS43 required only 13.7 pounds of raw steel, the PPSh41 had needed 30.6; indeed, the production of the Sudayev gun over the PPSh41 saved more than a thousand tons of steel per month, and decreased the number of workers needed to produce an equivalent number of submachineguns by more than fifty-five percent. 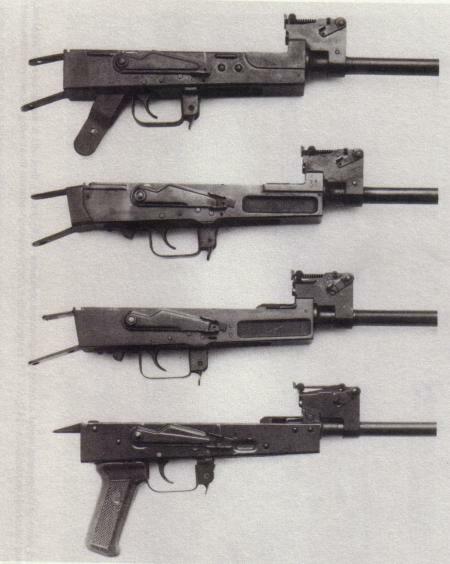 By moving to the PPS43, a gun made almost entirely from stamped sheet metal, the Armament Commissariat was able to increase monthly submachine gun production from 135,000 to 350,000 guns. Russian sources are unclear as to the decision making process that made the use of stamped sheet metal a requirement of the AK-47 production plan. It is likely that the production engineers with whom Kalashnikov worked, themselves products of the wartime resource debacle, were the driving force behind the decision to manufacture the rifle using the stamped sheet metal concept. Indeed, Soviet economists and technologists trying to rebuild the nation's factories and production capacity in the wake of the Second World War were looking for any technological shortcuts that would enable new small arms, tanks, artillery, and aircraft to be rapidly produced without embarking on new and expensive machine tool building programs. Such programs would have required the services of the most skilled of laborers in the Soviet labor force, and forced the nation to spend rubles the war-torn economy simply didn't have. The initial AK-47 production model then, was made with a stamped, sheet metal receiver. Somewhat inexplicably, after only three years of production, this model was abandoned in favor of one with a traditionally machined receiver. One hypothesis that was put forth by Western technical intelligence organizations was that the early sheet metal receiver simply lacked durability. The theory put forth was that the riveted and welded joints weakened and eventually gave way after extensive use. However, samples of first model AK-47's captured by Israeli forces in Lebanon in 1982, and evidencing many years of hard, if not neglectful use, show no weakening of the joints or rivets. Another hypothesis has more to do with the Soviet defense industry's technological base. It has been suggested that in the immediate post-war years, many portions of the Soviet defense industry were competing for skilled laborers in key categories such as tool and die makers (who made the stamping dies for the manufacture of small arms, motor vehicles, and aircraft). During the postwar rearmament, the portions of the defense industry that were making major end items such as armored personnel carriers and aircraft had more political wherewithal than the small arms factories. Since many of the major small arms factories still had substantial quantities of traditional metal working machinery (milling, broaching, turning, and drilling tools), it was easier to modify the manufacturing processes for making AK-47's than it was to muster the necessary political alliances to get the machinery and manpower resources for those factories. an unsatisfactory method of attaching the buttstock and triggerguard. It gave way in 1953 or 1954 to the third model Kalashnikov. This was the basic model of milled receiver AK-47 that is generally recognized the definitive AK-47. The third model AK-47 was manufactured until about 1959 when the AKM was introduced. an opytno-konstruktorskoe byuro (OKB, experimental design construction bureau) centered on Kalashnikov and his team was established. Within the Soviet military establishment the OKB's were responsible for the development and initial testing of new ordnance. By the mid-1950's, Kalashnikov was able to draw on manufacturing resources of factories beyond the traditional small arms centers (Tula, Izhevsk and Sestroryetsk). Many of the components for the Kalashnikov rifles were now subcontracted to smaller industries. It was this stronger industrial environment that allowed the Kalashnikov OKB to create the AKM. The introduction of the AKM in 1959, and the return to a stamped receiver, provides almost as fertile a ground for speculation as the shift from the original sheet steel receiver to the machined receiver. In any event, there were some significant deign improvements embodied in the AKM. 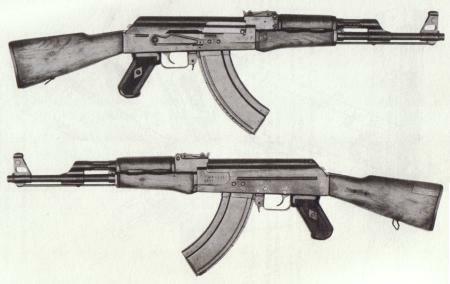 By reverting to sheet-metal fabrication production techniques, the AKM weighed significantly less than the AK-47 (6.92 versus 9.48 pounds). The AKM also had a new cluster of components added to the trigger assembly that serve as both a rate of fire reducer and a mechanism to eliminate "bolt bounce" (i.e., the prevention of misfires due to the failure of the bolt to lock during automatic fire). 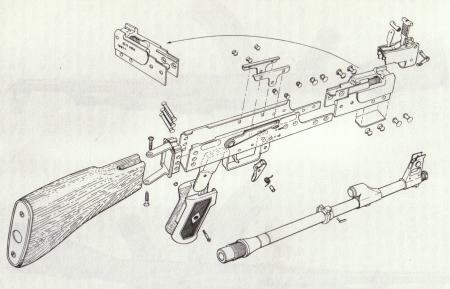 The Soviet service manual describes these components as a "hammer delay," and states that: "The hammer delay serves to delay movement of the hammer forward so as to improve the accuracy of fire during the conduct of automatic fire." The AKM is also more accurate than the AK-47, and the sights were recalibrated for a maximum range setting of 1,000 meters instead of the 800 of the AK-47. The AKM can be recognized by its sheet-metal receiver with indentations on the sides of the magazine opening (these "dimples" serve as guides for the magazine when it is inserted into the opening), the raised grasping rails on the forearm, the corrugations on the receiver cover, the absence of gas vent holes in the gas tube assembly, and a small compensator. Aficionados of and those familiar with the developmental histories of western military weapons are well acquainted with how issues of politics, national and personal ego, and economic realities often exercise greater influence the development of military small arms than operational or engineering concerns. The British adoption of the FAL over the EM-2 (and later the L85A1 over the M16), the US adoption of the M14 and later the M16, and even NATO standardization on the 7.62mm cartridge at the insistence of US Colonel Rene Studler are all stories evidencing this trend. What is surprising to many is that despite having a centralized economy and an autocratic government that made virtually unlimited funds available for the development of military hardware, the Soviet Union fell victim to these same vagaries. What is even more surprising is that in spite of these "non technical hurdles" the Soviets managed to field the finest infantry rifle of the twentieth century.